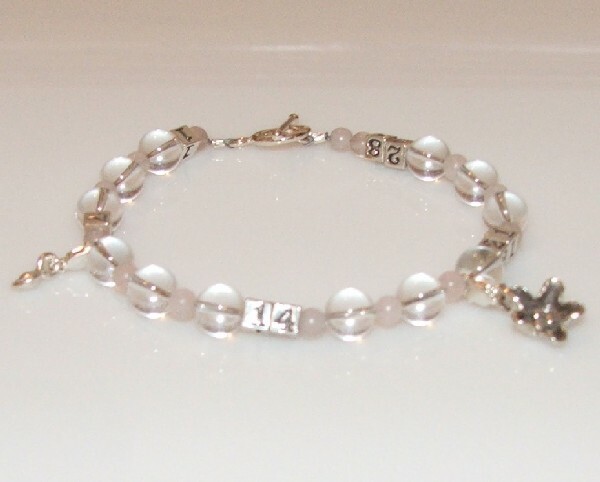 Ovulation Predictor Calendar Bracelet in Crystal & Rose qrt. The Cycle Diet™ Ovulation Predictor Calendar bracelet is uniquely designed to be worn while on the diet as a subtle reminder to cycle dates and phases or as a tool for conception. It looks like expensive jewelry, but is designed to help you with your fertility choices. Some believe crystals have special powers that remove negative energies interfering with fertility. If you are trying to become pregnant choose the rose quartz or amethyst semi-precious stones which reflect the colors of the fertility chakras. 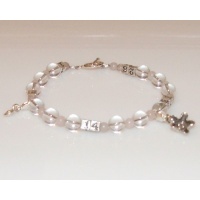 These bracelets are made from high quality sterling silver and semi-precious stone beads. Your important fertility dates will always be handy as a reminder when making personal plans. Thirty-one beads represent each day of the month with the numbers 1, 7, 14, 21 and 28 in solid sterling silver blocks. Bracelets comes with two beautiful sterling silver moveable charms that mark your anticipated ovulation date and the first day of your cycle. The small round charm, reminiscent of an egg indicates your ovulation date. The flower charm marks the anticipated day 1 of your cycle or the start of menses. Most women's cycles are 28 days in length but can be shorter or longer, if you are wanting to become pregnant you may want to use a home LH monitor kit.